We’ve got all sorts of post-holiday goodies to share. New OpenSSL APIs, Dtrace, OpenBSD desktops, a truly paranoid start to your 2017 security & more! As many of you will already be aware, the OpenSSL 1.1.0 release intentionally introduced significant API changes from the previous release. In summary, a large number of data structures that were previously publically visible have been made opaque, with accessor functions being added in order to get and set some of the fields within these now opaque structs. It is worth noting that the use of opaque data structures is generally beneficial for libraries, since changes can be made to these data structures without breaking the ABI. As such, the overall direction of these changes is largely reasonable. However, while API change is generally necessary for progression, in this case it would appear that there is NO transition plan and a complete disregard for the impact that these changes would have on the overall open source ecosystem. So far it seems that the only approach is to place the migration burden onto each and every software project that uses OpenSSL, pushing significant code changes to each project that migrates to OpenSSL 1.1, while maintaining compatibility with the previous API. This is forcing each project to provide their own backwards compatibility shims, which is practically guaranteeing that there will be a proliferation of variable quality implementations; it is almost a certainty that some of these will contain bugs, potentially introducing security issues or memory leaks. I think this will be a bigger issue for other operating systems that do not have the flexibility of the ports tree to deliver a newer version of OpenSSL. If a project switches from the old API to the new API, and the OS only provides the older branch of OpenSSL, how can the application work? Of course, this leaves the issue, if application A wants OpenSSL 1.0, and application B only works with OpenSSL 1.1, how does that work? Due to a number of factors, software projects that make use of OpenSSL cannot simply migrate to the 1.1 API and drop support for the 1.0 API – in most cases they will need to continue to support both. Firstly, I am not aware of any platform that has shipped a production release with OpenSSL 1.1 – any software that supported OpenSSL 1.1 only, would effectively be unusable on every platform for the time being. Secondly, the OpenSSL 1.0.2 release is supported until the 31st of December 2019, while OpenSSL 1.1.0 is only supported until the 31st of August 2018 – any LTS style release is clearly going to consider shipping with 1.0.2 as a result. Platforms that are attempting to ship with OpenSSL 1.1 are already encountering significant challenges – for example, Debian currently has 257 packages (out of 518) that do not build against OpenSSL 1.1. There are also hidden gotchas for situations where different libraries are linked against different OpenSSL versions and then share OpenSSL data structures between them – many of these problems will be difficult to detect since they only fail at runtime. Hopefully, most projects will decide to switch to the cleaner APIs provided by s2n or libtls, although they do not provide the entire functionality of the OpenSSL API. Another similar way to create a backchannel but without transmitting anything is to introduce delays in the receiver and measure throughput as observed by the sender. All we need is a protocol with transmission control. Hmmm. Actually, it’s easier (and more reliable) to code this up using a plain pipe, but the same principle applies to networked transmissions. For every digit we want to “send” back, we sleep a few seconds, then drain the pipe. We don’t care about the data, although if this were a video file or an OS update, we could probably do something useful with it. In this simple example, the secret data (argv) is shared by the processes, but we can see that the writer isn’t printing them from its own address space. Nevertheless, it works. Time to add random delays and buffering to firewalls? Probably not. Over at hackernews we have a very non-verbose, but handy guide to getting to a OpenBSD desktop in about 30 minutes! First, the guide will assume you’ve already installed OpenBSD 6.0, so you’ll need to at least be at the shell prompt of your freshly installed system to begin. A few small tweaks later for xscreensaver and your xinitrc file, then you are ready to run “startx” and begin your desktop session! All in all, great guide which if you are fast can probably be done in even less than 30 minutes and will result in a rock-solid OpenBSD desktop rocking Lumina none-the-less. I had been procrastinating making the family holiday card. It was a combination of having a lot on my plate and dreading the formulation of our annual note recapping the year; there were some great moments, but I’m glad I don’t have to do 2016 again. It was just before midnight and either I’d make the card that night or leave an empty space on our friends’ refrigerators. I’m not the first person to hit this. The problem seems to have existed since CS6 was released in 2016. None of the solutions were working for me, and — inspired by Sara Mauskopf’s excellent post — I was rapidly running out of the time bounds for the project. Enough; I’d just DTrace it. Brian Everly over at functionally paranoid has a treat for us today. Let us give you a moment to get the tin-foil hats on… Ok, done? Let’s begin! Out of those options, Brian mentions that he uses disk encryption and yubi-key for all his secure network systems. For added security, naturally he firewalls the router by plugging in the LAN port to a OpenBSD box which does the 2nd layer of firewall / router protection. His post then goes in to talk about Backups and IoT devices, something else you need to consider in this truely paranoid world we are forced to live in. We even get a nice shout-out near the end! We’ve only covered some of the highlights here, but you really should take a few moments of your time today and read this top to bottom. Lots of good tips here, already thinking how I can secure my home network better. > Recently BSD UNIXes are being acknowledged by the application development community as an interesting operating system to deploy to. This is not surprising given that FreeBSD had jails, the original container system, about 17 years ago and a lot of network focused businesses such as netflix see it as the best way to deliver content. This developer interest has led to hosting providers supporting FreeBSD. e.g. Amazon, Azure, Joyent and you can get a 2 months free instance at Digital Ocean. 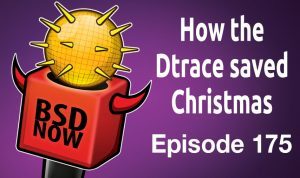 DTrace is another vital feature for anyone who has had to deal with production issues and has been in FreeBSD since version 9. As of FreeBSD 11 the operating system now contains some great work by Fedor Indutny so you can profile node applications and create flamegraphs of node.js processes without any additional runtime flags or restarting of processes. This is one of the most important things about DTrace. Many applications include some debugging functionality, but they require that you stop the application, and start it again in debugging mode. Some even require that you recompile the application in debugging mode. 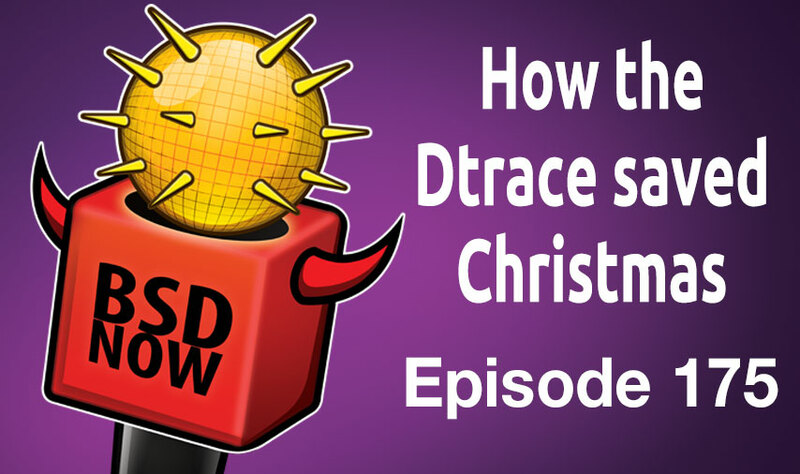 Being able to attach DTrace to an application, while it is under load, while the problem is actively happening, can be critical to figuring out what is going on. > I hope you find this article useful. The ability to look at a runtime in this manor has saved me twice this year and I hope it will save you in the future too. My next post on freeBSD and node.js will be looking at some scenarios on utilising the ZFS features. A lot of work to get SSHGuard working with new log sources (journalctl, macOS log) and backends (firewalld, ipset) has happened in 2.0. The new version also uses a configuration file. Most importantly, SSHGuard has been split into several processes piped into one another (sshg-logmon | sshg-parser | sshg-blocker | sshg-fw). sshg-parser can run with capsicum(4) and pledge(2). sshg-blocker can be sandboxed in its default configuration (without pid file, whitelist, blacklisting) and has not been tested sandboxed in other configurations.